I worked this small point de gaze needlelace motif as part of the City & Guilds Lacemaking Part 2 course. 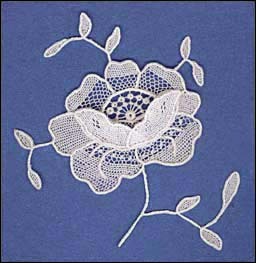 With the extra petals added to give a three-dimensional effect, it is typical of the many roses found in point de gaze lace from about 1870 onwards. This style of rose became very popular and was widely copied — I have seen it in Bedfordshire and in machine-made laces. The leaves and extra petals are worked in corded stitch, the other petals in corded stitch and point de gaze mesh. The spots in the mesh of the lower petals are worked by taking a thread around one mesh several times (a bit like a tally in bobbin lace). The centre has spokes with couronnes and woven wheels. The two extra petals were worked separately and attached with tacking stitches once everything else was finished. I worked with DMC Broder machine 50 thread and used six strands of this for padding the raised edges. Nineteenth century point de gaze was also made with cotton thread, usually manufactured in England, but it would have been much finer than the one I used.